Well, this is kind of cool if you're a basketball fan and gamer — 2K Sports and Euroleague Basketball just announced "an exclusive multi-year global partnership" that paves the way for the inclusion of some of the top clubs in Europe in the annual "NBA 2K" series of video games, beginning with 14 Euroleague teams in the forthcoming LeBron James-covered "NBA 2K14" for Xbox 360 and PlayStation 3, as well as the not-yet-released next-generation systems Xbox One and PlayStation 4. While games have included ways to use non-NBA players in the past — fan-made modified rosters shared online, for example, or the (sadly one-time-only) inclusion of several national teams in "NBA Live 2008" in conjunction with the 2008 Summer Olympics in Beijing — this represents the first time an official deal has been reached to include European club teams and players in a game. 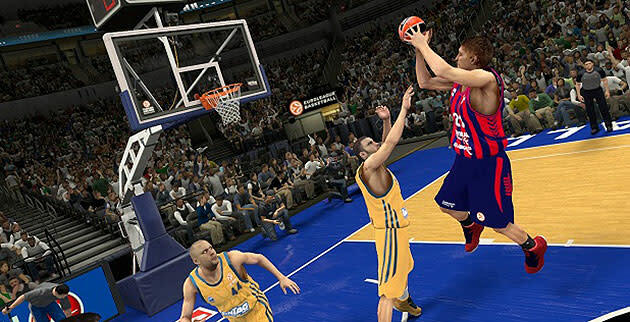 "European basketball has an incredibly passionate following, and we’re all excited to give fans the opportunity to take on Europe’s best in 'NBA 2K14,'" said Jason Argent, senior vice president of sports operations for 2K Sports, in a statement announcing the deal. • From Germany, Alba Berlin. I've already heard from a couple of fans wondering why certain teams weren't included; I don't know, but here's hoping the list expands as the multi-year deal progresses. The integration ought to help continue to raise the North American profile of the Euroleague, which is the top level of pro ball in Europe, featuring 31 teams from 18 countries, with the league roster evolving year-to-year depending on how teams finish in the pro leagues in their home nations. (Sort of like the Champions League in European soccer.) Select Euroleague games are broadcast on NBA TV in the U.S. and Canada, and the NBA and Euroleague hold exhibition games each October before the start of the NBA season. Last year, the Boston Celtics and Dallas Mavericks went to Europe while Real Madrid, Montepaschi Siena and Maccabi Haifa came to North America; this preseason, the Oklahoma City Thunder and Philadelphia 76ers will head overseas, while CSKA Moscow comes to the U.S. for a pair of games. Plus, many NBA fans are likely more familiar with the Euro clubs than they might think. Stars like Pau Gasol, Marc Gasol, Manu Ginobili, Ricky Rubio and Danilo Gallinari all spent time in the Euroleague before coming to the NBA, and former NBA players like Rudy Fernandez, Juan Carlos Navarro, Acie Law, Andres Nocioni, Jordan Farmar, Nenad Krstic and Sonny Weems dot Euroleague clubs' rosters. The increased globalization of the game doesn't seem to be abating any time soon, either. Twenty players born outside the United States were selected in last Thursday's 2013 NBA draft, including 13 who'd only played overseas, four of whom came from Euroleague clubs — Lietuvos Rytas guard Nemanja Nedovic (Golden State Warriors), Barcelona youngsters Alex Abrines (Oklahoma City Thunder) and Marko Todorovic (whose rights went to the Houston Rockets in the Thomas Robinson trade), and former Partizan big man Joffrey Lauvergne (Denver Nuggets). It remains to be seen if the European clubs integrated into the game beyond just being able to select them in head-to-head matchups — it'd be amazing if you could put your Create-a-Player on a Euro club, for instance, although that seems unlikely. Either way, this seems like a cool thing for gamers and a neat step toward virtual basketball more accurately reflecting the true-to-life reality of the game's evolution. More and more NBA front offices are including Euroleague players in their future plans — why shouldn't those at the controls of virtual franchises follow suit?